Before choosing a property, imagine living in the mountains. What kind of home do you want to live in? Cut out pictures you like from magazines and books: your favorite kitchen, the special trim you want, that beautiful bathroom you love, or anything else that impresses you. An idea file will help everyone understand what you want. Before you buy property, set your budget. Be sure you can afford to build the home you want. Ask yourself, how much cash can I spend? How much can I borrow? Banks and mortgage companies will "prequalify" you. They look at your income and expenses to see how much you can afford for a house payment and how much you can borrow. Don't plan your budget too tight. Unexpected changes like an increase in mortgage interest rates could make your payments larger than you planned. How much of your budget can be spent on building and how much on property? Your realtor can help you compare the prices of recently built homes and vacant properties. Knowing how much was spent on property, site work, and construction can help you set your budget. Your realtor can help you find affordable land. Realtors use a multiple listings service, a list of properties for sale by all the realtors in your area. Look at the properties that are priced less than your budget. Consider: On what kind of property will my house look the best? Do I like the privacy of lots of trees or a clear view? Will the property be suitable for me in the winter? (Snow melts more quickly off a south facing slope) Will the road be too treacherous? Will the site have too much wind? Is the location convenient? Is the property too far from town or work? What is the neighborhood like? Can I get all the utilities I want? You may not find the perfect property, but if you are more specific, your realtor can be more helpful in your search. When you find your property, make an offer with contingencies that 1) you get acceptable financing, water, septic, and driving access 2) the property passes a title search and survey, and 3) you can get permits to build your home on this lot. The purchase price is usually negotiable. With this purchase offer you need to make a deposit. This guarantees the seller that you will not back out as long as your terms and contingencies are met. This deposit also shows the seller that your offer is serious. Wait until you reach step (8) to close on the property. The first rule in Real Estate is “location, location, location”. In the mountains it is “View, View, View.” Size is important, but many smaller parcels offer greater views and may adjoin undeveloped space, making them equal to larger more expensive parcels. 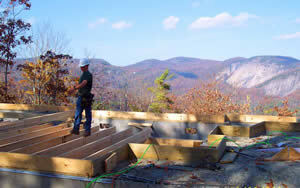 Hiring a home designer can protect you from many of the challenges of building a mountain home. Homes built on steep slopes with poor foundations may have severe settling; due to poor design and construction some basements are always wet; strict septic tank and flood plain regulations seriously limit some properties; and some sites are too steep for building and driveway access. How can you be sure your home will be built properly? Including a good set of plans in your builder's contract can be a protection. These plans can help your builder understand what you want. They can make his job easier. Banks prefer good plans as well. It’s a good idea to put everything in writing. You need a local designer familiar with this area. It is a mistake to order your plans from a magazine. Not hiring a designer might save a few thousand dollars, but leads to much greater increases in construction costs. Your designer should visit your property before designing your home. The site will help define the design. How can you save trees and still have a view? Will facing the glass towards the view let in too much summer sun or winter cold? How should the home face the sun to be more comfortable and cost less to heat and cool? How can the driveway be brought in? Where will the septic go? A good set of plans is an investment that can pay off in lower construction costs, energy costs, and a much better home. Your designer will look at your ideas and combine them into a preliminary plan for you to see. Feel free to talk about what you like and dislike. This is the best time to make changes in the design. A good designer will listen closely to understand what you want. He / She will work on the preliminary design until you are happy with it. Now take your preliminary drawing to a builder to see if your home is within your budget. If not, your designer can modify the plan to meet your budget. You can also get input on your budget from a decorator, cabinet designer, etc. This is the best time to carefully think about your budget and make adjustments. Many wait until it is too late to discover they cannot afford their home. When talking with the builder, don't forget to ask about the costs of septic, water, driveway, and landscaping. Don’t allow yourself to become land poor...thereby limiting your construction budget. Now that your property and house are within your budget, your final plans can be drafted! You need plans that are accurate and easy to read. The home should fit your needs. It should blend in with your property and be as easy to build as possible. The structure should be well designed to support your home, while protecting your family from the forces of nature. Your plans can also serve as a legal document, making sure you, your builder, and all the trades people understand what is expected. 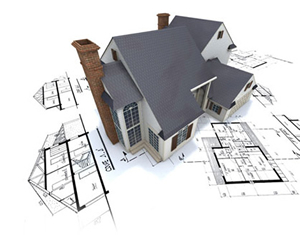 Take the final plans to several good builders and ask for a complete proposal in writing. A good set of plans will make it easier for the builder to put together an accurate proposal. Make sure all your questions are answered. Ask: How long will the construction take? How much will it cost? Some builders quote low because their budgets for carpet, lighting, plumbing, cabinets, landscaping, etc. are too small. Remember to have your plans included as part of the builder's contract. Some builders will agree to a price before starting. These fixed price contracts tend to be high since the risk is with the contractor. Others prefer working on "cost plus" basis. (charging whatever the project costs plus an additional percentage as profit) There are advantages and disadvantages to this method. A dishonest builder can hide extra costs (such as materials for other jobs, tools, and unnecessary labor). The builder is not encouraged to be thrifty. But, if your builder honestly discloses all the costs, you can see where the money went. This can simplify your dealings with the builder, especially if there are changes during construction. The builder does not have to bid higher to cover unexpected problems. If your builder is honest and thrifty, you could come out ahead with cost plus. It is most important to investigate each builder's reputation. Ask for references and customers. Is the builder easy to work with and reliable? Does he have complaints registered with the Better Business Bureau or area Builders' Associations? Taking time to choose a good builder can save you time and money and help you to have a better home. You need to choose a lender now. Take your plans, building contract, and you’re financial and property papers to several lenders to discuss your financing. You might need several years of income tax records, investment and insurance papers, bank statements, and debt statements. There are two kinds of loans for your home: construction loan and mortgage. 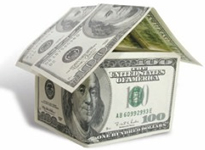 The construction loan provides the money for the construction of your home. The bank pays the contractor several installments (draws) when the home reaches certain stages of completion. You pay interest on what the bank pays the contractor. The interest rate is higher than for a mortgage. When the house is complete you get a mortgage to pay off the construction loan. Each lender has different policies. Compare terms, interest rates, and loan fees. Is there a limit on how long the bank will allow for construction? Will the builder be happy with the draw schedule? Would you prefer the bank to check with you before paying a draw? What kind of insurance does the bank require during construction? The bank will want a title search, survey, and an appraisal to process the loan. These requirements protect you and the bank from several expensive legal problems that could happen. Now is the time to close on the purchase of your property. If you are financing this purchase, the bank will help you. A good real estate attorney will make sure the property is clear of liens (previous debts) and encumbrances (problems with the property lines). Title insurance will guarantee this. First, your builder will pull the permits. Your builder coordinates many workers to build the home. 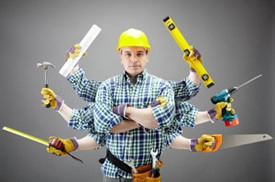 Some may be employees, but most will be subcontractors (workers who are in business for themselves providing service to more than one builder). Your builder also coordinates with suppliers to make sure everything is delivered when needed. A good set of plans will make his job easier. There are many stages in building a home. First, a steel reinforced concrete foundation is built to keep your house well anchored. Next, the house is "framed," including floor joists, wall studs, and roof trusses. Then the house is "dried in" by installing sheathing, roofing, windows, siding, plumbing, electrical, and insulation. Wall and ceiling materials are installed. After this, the cabinets, fixtures, and appliances are installed. The house is painted and flooring is laid. Seeing these changes is exciting! But a word of caution: No matter how carefully your home is planned and built, you will wish you had done something differently. Don't expect perfection. Good communication between builders and homeowners can avoid many problems. Your builder knows you want to move in as soon as possible, but his other customers are probably pressuring him too. Also, his subcontractors work for other builders. Even the best builders occasionally miss deadlines, but your builder should keep you informed of any problems and changes in schedule as they occur. You can promote good relations by being understanding. This will result in a smooth project and a better home. Be positive and enjoy it. When the construction is complete, you can obtain your final mortgage and pay off the construction loan. The building inspector will issue a certificate of occupancy when the home passes final inspection. The bank may also require their own inspection to make sure the home is completed to their standards. If you are having serious problems with your builder and you feel you must take legal action, you might want to talk to an attorney before moving into the home. When these steps are completed you can move in to your new home! Congratulations, you did it! The author, Mr. Richard C. MacCrea, designs homes for the mountains.